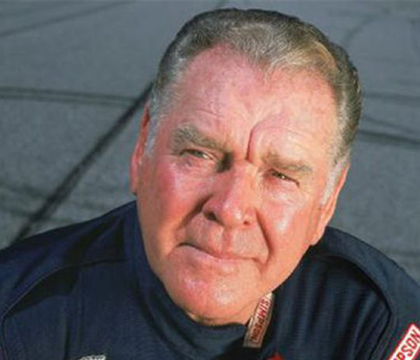 Elzie Wylie “Buddy” Baker Jr., the 1980 Daytona 500 champion and famed NASCAR commentator, has died after a battle with cancer. He was 74 (b. 1-25-41). 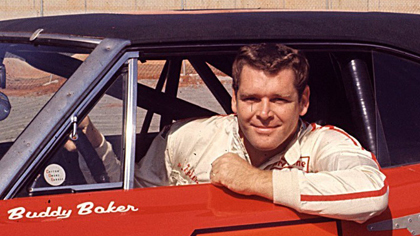 At 6 feet 6 inches tall, Buddy Baker was often called the “Gentle Giant,” though the nickname “Leadfoot” was more apropos due to the blistering speeds he often achieved during his 33-year career. In 1970, Baker became the first driver to eclipse the 200-mph mark on a closed course while testing at Talladega Superspeedway. Although he didn’t win at the 2.66-mile superspeedway that year, Baker visited Talladega Victory Lane four times throughout his stellar career. A race commentator and radio host during a lengthy and prolific post-racing career, the Charlotte, North Carolina native’s biggest win came in the 1980 Daytona 500. He finished with an average race speed of 177.602 mph – a track record that still stands. Baker, son of NASCAR Hall of Famer Buck Baker, accumulated 19 wins in the premier series, including a victory in the 1970 Southern 500 at Darlington Raceway where he lapped the rest of the field. In 1972-73, Baker became the first driver to win consecutive World 600s. He also won the inaugural preseason event now known as the Sprint Unlimited in 1979. He was named one of NASCAR’s 50 Greatest Drivers in 1998, and in 2014 was first nominated for inclusion into the NASCAR Hall of Fame. After retiring in 1992, Baker made a successful transition to the television booth as a commentator for The Nashville Network and CBS. He most recently served as a radio co-host on “Late Shift” and “Tradin’ Paint” for SiriusXM NASCAR Radio.